Black-and-white television was, by far, the simpler of the two systems, and the less greedy of radio bandwidth. The camera, as used on Apollos 8, 9 and 11 had just one imaging tube and operated at scan rates that would normally be called slow-scan television. The frame rate used was only 10 frames per second with 320 lines per frame. The bandwidth of the signal (which defined how well the fine detail of the image was handled) was restricted to a very low value of 0.4 MHz (as compared to about 5 MHz for broadcast TV). The camera used a vidicon type of imaging tube that was notorious at the time for exhibiting excessive image lag, whereby a ghostly smear would trail behind the moving image. When the pictures reached Earth at this non-standard frame rate, they were electronically incompatible with just about every TV system on the planet, so the ground stations had converters to generate standard US television signals from them. The converter worked in two stages. The first simply consisted of aiming another vidicon TV camera at a small television screen. The screen displayed the images from the Moon at 10 frames per second while the camera, running at 60 fields per second, was allowed to take a valid image each time a full image was displayed, which was every tenth of a second. In other words, only one field in six from the camera contained a picture. The second stage was to recreate the missing five fields by recording the single good frame from the TV camera onto a magnetic disk and replaying it five times to reconstruct the full 60-fields-per-second TV signal, ready for distribution to Houston. The repetition of the fields and additional lag from the second camera added to the ghostly impression left by Apollo 11's moonwalk coverage. A question that is often asked is, if Neil Armstrong was the first man on the Moon, who operated the TV camera? It is a spurious question because it assumes that all cameras must have a cameraman behind them. In fact, Eagle's camera was mounted upside-down inside a fold-down panel next to the ladder. At the top of the ladder, Armstrong pulled a lanyard to open the panel and thereby reveal the camera. Apollo 11's TV camera mounted upside down on one of Eagle's panels. On Earth, the conversion equipment had a switch which the operator flicked to right the upside-down picture. 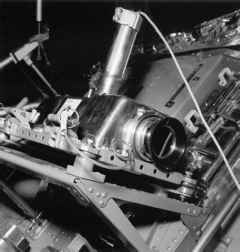 Once both crewmen were on the surface, Armstrong lifted the camera from its mount and placed it on a stand from where the TV audience could watch proceedings. The operator threw his switch back to restore the image's orientation.